India indeed is a place of mysteries. 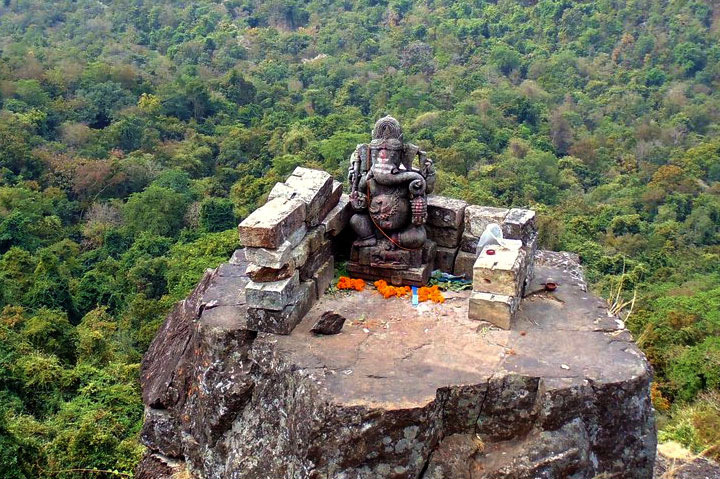 From the submerged town of Dwarka to the remains of different deities, another mysterious thing to be discovered was the idol of Lord Ganesha situated at a height of 13000 feet! With this discovery, many questions about its existence popped up. Building a huge statue at such an enormous height was nearly impossible for the human race at that time. The sad part is that this idol is no more seen. How, when and why? Time to pour some light on the Ganesha idol at 2994 ft! 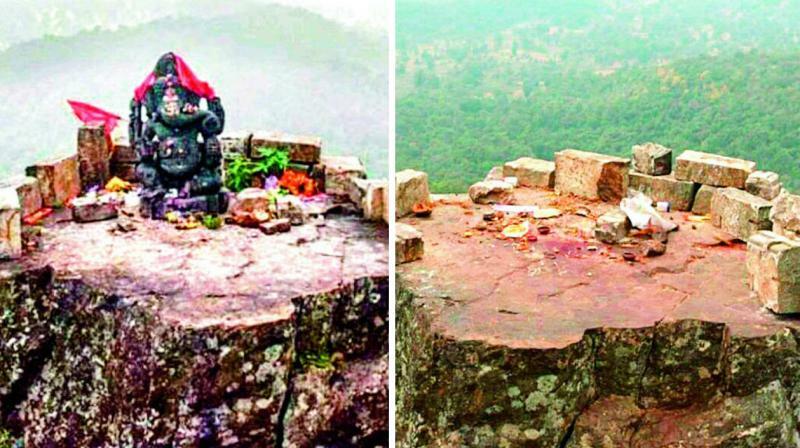 The zenith of Dholkal mountain in the interiors of Maoist Bastar is the place where this magnificent piece of work once found itself. It is also the place where the great battle between Ganesha and Parshuram took place. The discovery of it by a local journalist in 2012 left the archaeologists in a situation of biting their nails. Since the time it came into the headlines people from every corner of the country visited this place to seek the Lord’s blessings. By that time it had got an enormous importance. How did it look and when was it made? Amidst dense & moist forest sat the humongous six feet high & 21 feet wide idol of Lord Ganesha. A massive search operation was conducted by the archaeology department followed by extensive research. The study stated that the idol was built at the time of the Nagvanshi Dynasty around 9th Century A.D. Also, the stone weapons discovered in the vicinity are seen as signs of the early human life. As the idol is very old, not much information about it has been collected. Why is it no more? According to the reports of Danik Bhaskar, the statue went missing on January 26, 2017. It is believed that the unique idol was allegedly destroyed by the Maoists in Chhattisgarh’s Dantewada. As per a report in the Times of India, “Experts and conservationists term this a major blow to archaeology.” This was not probably the first time when the Maoists had hindered the state’s rich history. Bastar Police said that smashing the idol into 56 pieces was their way of stopping the development in the district. As more and more people came to visit the open temple of Lord Ganesha the area started to develop. Moreover, the government had sanctioned Rs.2 crore for the further development which the Maoists could not digest. Also Read : Did you know about the feminine form of Lord Ganesha? Not only this but Bastar had many important idols, temples, which have been excavated off their existence or destroyed forever. The ancient place initially doomed with backwardness and now with Maoists, calls for attention and grooming from the government. This place has been considered a place of scenic beauty with thousands of archaeological and historical secrets hidden in its torso. Few locals, who chance upon new findings, bring it to the notice of officials but many put a curtain, assuming that revealing it would disturb the ambiance of their place with archaeologists, media and foreigners digging all over. India is not a place of snake charmers and poverty but way beyond anybody’s imagination. With proper guidance and attention from the government, the world can witness what India beholds beneath and above the holy soil. Update – The Idol was restored within a week.